Aiseesoft Blu Ray to Wii Ripper is one type of Blu Ray ripping softwares:It can Rip Blu Ray Disk and Convert DVD files to Wii and Convert video/audio formats to Wii ones. It provides the functions to vary output files such as cutting,cropping videos,merging several video segments into one file ,with wonderful files outputted to your taste.Aiseesoft Blu-ray to Wii Ripper for Mac is easy to use for both green hand and advanced users. It can rip blu ray disk and convert DVD files to Wii with great edit functions. ...... Even you can adjust video brightness, saturation and contrast. 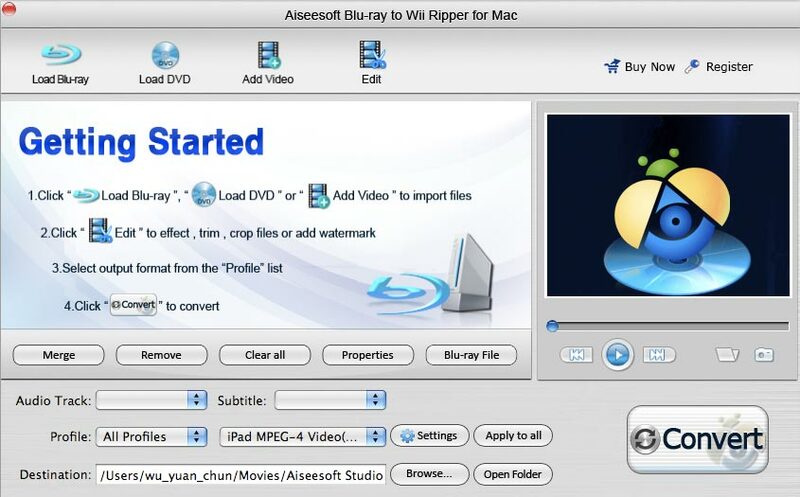 With Aiseesoft Blu-ray to Wii Ripper for Mac, you can easily rip Blu-ray, DVD and video to Wii compatible video formats. The Blu-ray to Wii Ripper for Mac can assist you to rip Blu-ray disc to popular audio files, which are supported by Wii. To convert the Blu-ray movie freely, Aiseesoft Blu-ray to Wii Ripper for Mac can help you remove the DRM protection (AACS, BD+, MKB V24, etc.) from the BD. You can convert any video length through setting the accurate start and end time. Aiseesoft Blu-ray to Wii Ripper for Mac can help you crop video playing area and choose video aspect ratio. Watermark your video in the form of text or image and adjust its position and transparency. DVD Ripper fast speed ripping dvd to all popular video and audio on Mac OS X.
Qweas is providing links to Aiseesoft Blu-ray to Wii Ripper for Mac 3.1.32 as a courtesy, and makes no representations regarding Aiseesoft Blu-ray to Wii Ripper for Mac or any other applications or any information related thereto. Any questions, complaints or claims regarding this application Aiseesoft Blu-ray to Wii Ripper for Mac 3.1.32 must be directed to the appropriate software vendor. You may click the publisher link of Aiseesoft Blu-ray to Wii Ripper for Mac on the top of this page to get more details about the vendor.